Prices start at 7,675 rubels, less than 1,000 kroner, for a one-way ticket. Nordavia’s new route directly from Murmansk to Oslo will depart from Murmashi airport at 01.50 local time with arrival at Oslo airport Gardermoen at 03.25 Norwegian time. 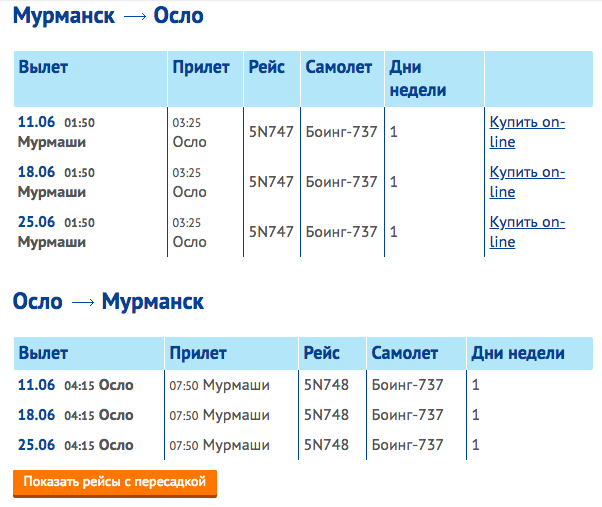 After a 50 minutes ground stop, the aircraft returns at 04.15 with arrival in Murmansk at 07.50. From Gardermoen, the first airport express train leaves to the city centre at 05.30, but there are a few airport express busses to different destinations downtown Oslo also at night. A one way ticket without luggage will cost you 7,675 rubels (984 kroner). Add another 1,500 rubels (192 kroner) and you can check-in with luggage. A full fare ticket costs 24,550 rubels (3,149 kroner). In April, Nordavia representative Viktor Anoshkin told the Barents Observer that flights were to start on June 4th and continue with one weekly flight until October 21st. «If passengers show interest for the route, we will increase the number of weekly flights and extend them after October 21st,» Viktor Anoshkin said. Now, however, tickets for sale are limited to three flights, all on Mondays; June 11th, 18th and 25th. Nordavia will operate a 132-seats Boeing 737 on its flights to Oslo.